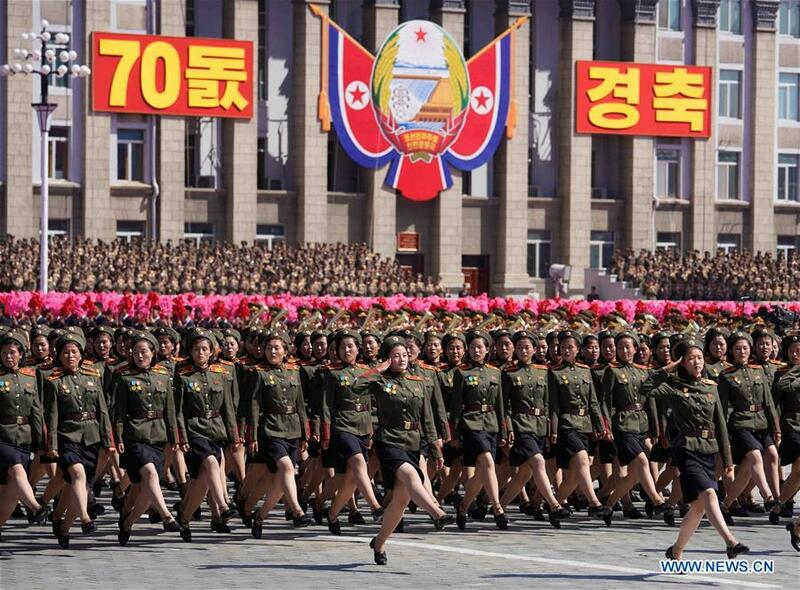 Pyongyang, Sept. 9 (Xinhua) -- A massive parade was held in Kim Il Sung Square in central Pyongyang on Sunday morning to celebrate the 70th anniversary of the founding of the Democratic People's Republic of Korea (DPRK). The DPRK's top leader Kim Jong Un and other senior officials attended the celebration, together with hundreds of foreign guests, ambassadors and representatives of DPRK nationals living abroad. Kim Yong Nam, president of the Presidium of the Supreme People's Assembly, said under the leadership of Kim Jong Un, the DPRK has made great achievements in economic construction. He urged citizens to carry out the strategic line of economic construction put forward at the Third Plenary Meeting of the Seventh Central Committee of the Workers' Party of Korea and to contribute to world peace and the unification of the Korean Peninsula. The two-hour parade saw thousands of people from all walks of life, including soldiers, workers, peasants and students, march through the square, waving flowers and shouting slogans such as "Long live supreme leader Kim." Some vehicles rolled through with banners, paying homage to the massive statues of the leaders and showcasing the achievements of the past 70 years. Some military weapons, including rockets and tanks, were also demonstrated in the parade. But the scale was not as big as expected and long-range missiles were not displayed. The parade was the first of its kind after the DPRK-South Korea and the DPRK-U.S. summits were held successively and the situation on the Korean Peninsula entered a state of dialogue. The celebrations began Saturday evening with a concert at the Pyongyang Indoor Stadium.